YouTube apologized on Monday for mistakenly linking the massive fire at Notre Dame Cathedral in Paris to the Sept. 11, 2001, terrorist attacks. The video giant said a new tool for battling misinformation made "the wrong call" when it displayed text from Encyclopedia Britannica about 9/11 in several videos of the iconic cathedral burning on Monday. "We are deeply saddened by the ongoing fire at the Notre Dame Cathedral," a YouTube spokesperson said. "These panels are triggered algorithmically, and our systems sometimes make the wrong call. We are disabling these panels for livestreams related to the fire." YouTube introduced the fact-checking feature last year to stem the spread of conspiracy theories, including those that question the terrorist attack on the World Trade Center in New York City that killed thousands. The algorithm is supposed to display information panels with links to third-party sources including Encyclopedia Britannica and Wikipedia while displaying videos on subjects linked to conspiracies, according to the company. Social media companies have been turning to computerized tools to help detect and eliminate fake news. Twitter suspended an account impersonating CNN earlier in the day after it incorrectly tweeted that the Paris fire had been caused by terrorism. 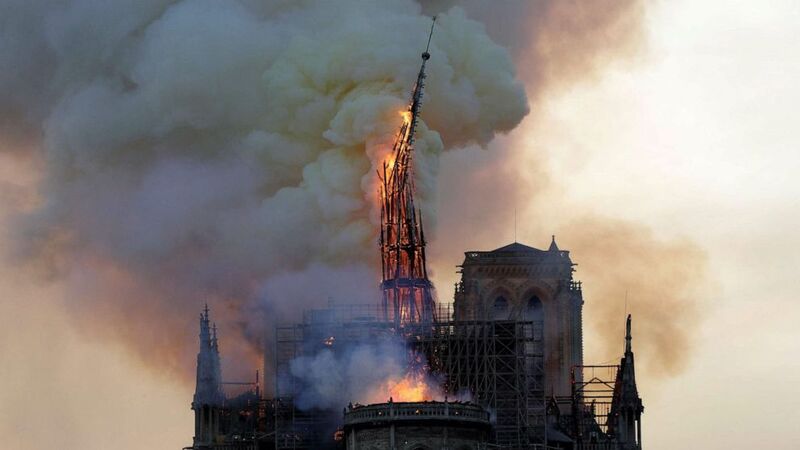 French officials are still working to determine the cause of the fire. A spokesperson for the historic cathedral described the damage as "colossal." "Everything is burning, nothing will remain from the frame," the spokesperson said.